iOS 6 introduced a new feature called VIP List to the Mail app. This feature allows you to create a list of senders that you consider high priority. When any of these senders sends you an e-mail, you’re notified through the iPad’s Notifications feature. Here’s how to turn the feature on. 1In the Mailboxes list in Mail, tap the Information button to the right of VIP. The information button is a lowercase i. 3Tap a contact to add that person to your VIP list. After this, press the Home button. In the screen that appears, shown in this figure, tap VIP. 5Tap the Show in Notification Center On/Off button to turn on notifications for VIP mail. 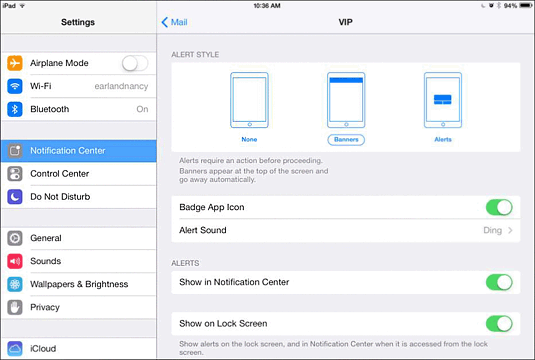 Tap an alert style, and specify whether the iPad should use a badge icon or sound to alert you. You can also choose to display VIP alerts on your Lock screen. 6Press the Home button to close Settings. 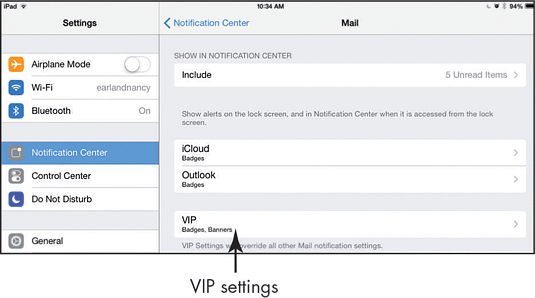 New mail from your VIPs should now appear in Notification Center when you swipe down from the top of the screen. Depending on the settings you chose in the previous step, the iPad may play a sound, display a note on your Lock screen, or display a blue star icon to the left of these messages in your Mail Inbox.